May 23, 2018. On Wednesday, June 13, 2018, from 9 am to 12:30 pm at Fair Haven Beach State Park, Sabin Hall, 14985 State Park Road, Sterling, NY, New York Sea Grant will host a Managing Great Lakes Residential Shorelines workshop for the owners of residential property along the shoreline of Wayne , Cayuga, Oswego, and Monroe counties. The workshop is free, but space is limited and registration is required: https://pub.cce.cornell.edu/event_registration. An optional tour of shoreline management techniques at Fair Haven Beach State Park is available after the workshop. For more information, contact New York Sea Grant New York Sea Grant Great Lakes Coastal Processes and Hazards Specialist Roy Widrig at 315-312-3042, rlw294@cornell.edu. 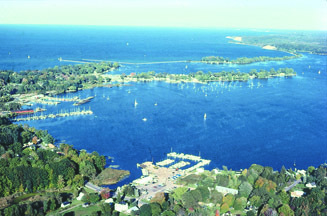 Property owners attending the workshop will gain an overview of coastal processes and shoreline erosion, how to select and work with shoreline contractors, and information on the permitting process for shoreline work in New York State’s Great Lakes coastal zones. “This workshop is designed to help shoreline property owners understand how coastal processes across Lake Ontario affect their shoreline specifically, and how different management techniques affect the coastal processes of the lake. For example, some properties have bedrock, others sand or cobble beachfront. Each property requires an approach applicable to its unique setting and the neighboring shoreline properties,” says Widrig. In addition to selecting and working with contractors to build shoreline structures, part of the discussion will note how nature-based shoreline techniques can also be used to build resiliency and better protect shoreline property from erosion. For more information, visit the New York Sea Grant Great Lakes Coastal Processes and Erosion web page at www.nyseagrant.org/glcoastal. New York Sea Grant is a cooperative program of Cornell University and the State University of New York, and one of 33 university-based programs under the National Sea Grant College Program of the National Oceanic and Atmospheric Administration. For updates on New York Sea Grant activities statewide, www.nyseagrant.org has RSS, Facebook, Twitter, and YouTube links. 0 Comments to "Shoreline Property Owners Workshop June 13"